If you love hockey then you spend your spare time on the ice. Chances are your off ice time is with your team and some drinks. 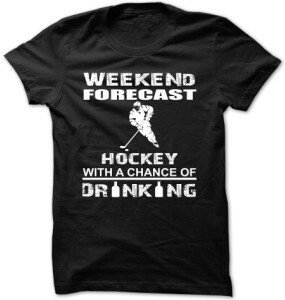 On the front of this t-shirt you see a white silhouette of a hockey player and the saying “Weekend Forecast Hockey With A Chance Of Drinking”. Notice the two letter “I’s” in the word drinking are beer bottles. Made to be very durable and last a long time aswell as super comfortable and soft to wear from 100% cotton. Available in a wide variety of men’s fitted sizes that range from Small to 4XL. Also check out the 6 fun and unique shirt colors to get this print on. This hockey drinking print is also available in a ladies t-shirt and a hoodie. It is pretty simple this t-shirt shows off that you are more of the athletic type than the educated type, with the saying “Education is important but hockey is importanter” with the word hockey all in capitol letters and yellow text. This classic t-shirt is available in a wide variety of sizes that range from Small to 3XL and it is made from 100% cotton to give it that comfortable soft feel but a long lasting durable shirt. Also there is 6 fun colors to choose from you can get this print on a hoodie or womens fitted shirt aswell. Show off your skills with this Education Is Important Hockey Is Importanter T-Shirt. The classic movie Slap Shot is remembered as on of the awesome cool hockey movies of all time, with so many fun and interesting characters any fan will love this t-shirt. On the front of this t-shirt find the famous Charlestown Chiefs logo, they are the hockey team that stars all the cool players like th Hanson Brothers and player coach Reggie Dunlop. You can find this officially licensed Chiefs t-shirt in a very wide variety of sizes, and it is made to be durable and comfortable and last a long time. 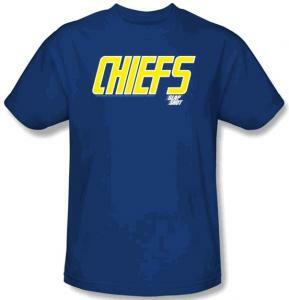 Support your favorite hockey team and movie with the Slap Shot Chiefs T-Shirt. If you are a goaltender in hockey then this is exactly what you would say …. Puck Me. 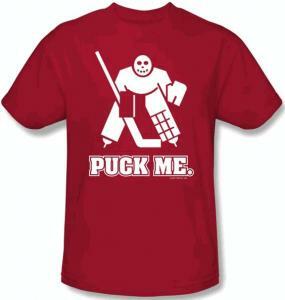 This is a fun t-shirt for a goalie find a white art image of a vintage looking goalie standing ready for a puck with the text underneath saying “PUCK ME.”. Available in sizes from Small to 3XLarge and it is made from 100% cotton making it a very durable shirt and still so soft and comfortable. All of your hockey buddies and all hockey fans will love this t-shirt. Get into this Hockey Goalie Puck Me T-Shirt.